Hashtags, ridden by Tatum Rice. Scootemenshootem Photography. Hashtags made a statement by winning the 5/6-year old finals at the Idaho Futurity last week. He put an exclamation mark on it with Saturday’s 233-point win in the Mercuria NCHA World Series of Cutting. The trip to Nampa, Idaho saw his career earnings pass the $400,000 mark, while he extended his lead in the NCHA World Standings to nearly $40,000. Owned by Hashtag Ventures of Weatherford, Texas, Hashtags was bred by Jim Haworth and is shown by Hall of Fame Rider Tatum Rice. The stallion is by Metallic Cat out of Dual Rey Tag, a daughter of NCHA Super Stakes champion Playin Tag. He has now earned more than $160,000 in the 2018 calendar year with limited age event wins at the Breeders Invitational, Bonanza, and Idaho. In the weekend column, Idaho was his second Mercuria win, following his victory at the Calgary Stampede over the summer. Stylish Look Bella, ridden by Morgan Cromer for Marvin and Paulette Teixeira of Santa Maria, California, marked 222 for second in the Idaho Mercuria. The mare is by Dual Smart Rey out of Stylishious, by Docs Stylish Oak. Constance Jaeggi on Scootemenshootem Photography. In the Non-Pro division, Constance Jaeggi of Weatherford, Texas marked 231 on 2016 NCHA Open Horse of the Year Ichis My Choice to win by six points from Elizabeth Quirk on Cat Sheree. The win lifts Ichis My Choice over the $400,000 mark in career earnings. Jaeggi, a Non-Pro Hall of Famer, rode into the record books, notching up her seventh Mercuria championship. 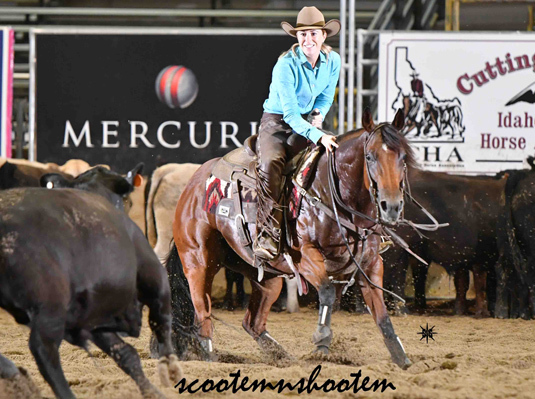 She had been tied at six with Dan Hansen for the most Non-Pro wins in the NCHA World Series. Jaeggi’s World Series wins began at the Battle in the Saddle in 2011 with Dual R Smokin, followed by five with Saguaro Ichi (Las Vegas 2014, and San Antonio, Houston, PCCHA Derby and Idaho in 2015) and now Ichis My Choice. It was actually the second Mercuria win for Ichis My Choice, who took the Open division with Grant Setnicka at El Rancho Futurity in 2016. Ichis My Choice is a six-year-old mare bred by EE Ranches, by Cat Ichi out of My Little Abra, by Abrakadabracre. 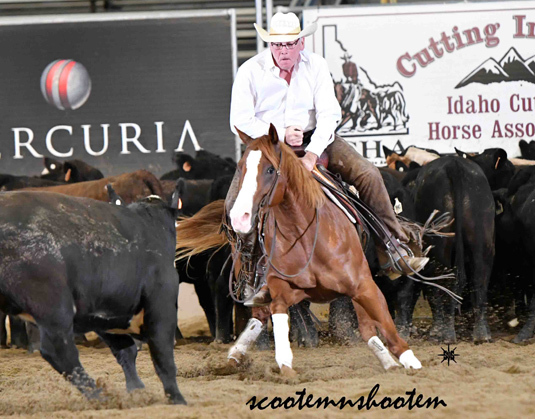 She was a $300,000 purchase at the 2014 Western Bloodstock NCHA Futurity Sales. In second place in the Non-Pro in Idaho, Elizabeth Quirk marked 225 on Cat Sheree, an eight-yeaer-old mare by High Brow CD out of Nurse Sheree. Quirk and Cat Sheree had previously won Mercurias this year at The Mane Event and the Pacific Coast Derby. David Harp on Kausac Kat. Scootemenshootem Photography. 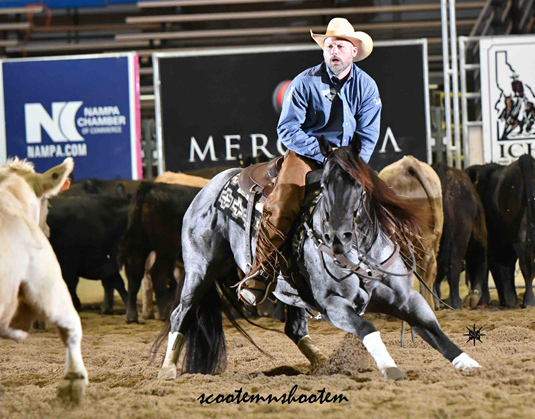 In the all-age $50,000 Amateur finals held before the Mercurias, David Harp of Rancho Murieta, California marked 221 on Kausac Kat to win. Kausac Kat is a seven-year-old gelding by Smooth As A Cat out of Lenas Tangygirl. He had previously won non-pro limited age championships with McKenzie Merrill and with Carol Ward. David Whitaker of Kaysville, Utah placed second in the Amateur with a 216 on Cartier Time, an 11-year-old son of One Time Pepto and CD Bright Lights.